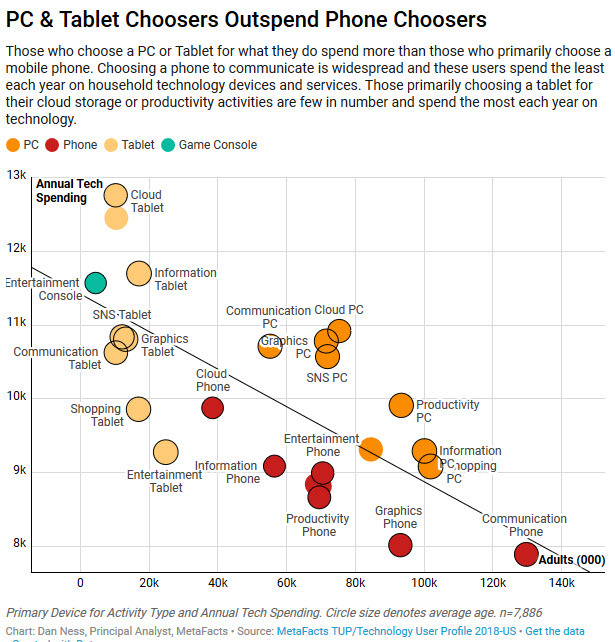 Those who choose a PC or Tablet for what they do spend more than those who primarily choose a mobile phone. Choosing a phone to communicate is widespread and these users spend the least each year on household technology devices and services. Those primarily choosing a tablet for their cloud storage or productivity activities are few in number and spend the most each year on technology. This is based on results from the latest MetaFacts TUP/Technology User Profile 2018 study, it’s 36th continuous wave. This analysis is focused on 7,886 U.S. survey respondents. The majority of online adults in the U.S. regularly use more than one device, and they’re increasingly choosing between their various devices for each of the activities they’d like to get done. As they experiment with their activities across different devices, they begin to develop preferences for one device type or another. For example, they may do some shopping on a smartphone as well as a tablet or PC, and then use a PC for the majority of their shopping activities. Similarly, they may communicate by text, email, voice or video calls across their devices, and then choose to use a smartphone for most of their communication activities. Communication activities especially favor mobile, highly-connected devices, to better let users enjoy quickly response or simultaneous communication. This is shown in the 129.8 million U.S. adults who primarily use a phone to communicate. There are 55.2 million U.S. adults who primarily use a PC to communicate, as they primarily use email or sit at their desktop or notebook for video conference calls. We compared these activity-device groups against annual household technology spending. This spending spans devices and services, from purchases of smartphones, PCs, printer and tablets, to internet and TV services, installation, and media. The biggest technology spenders choose tablets over PCs or phones for nearly every category of activity. This reflects in part that tablets are often a user’s third device, and that the biggest spenders have more devices than average. The growing use of cloud storage coupled with broadened wireless Internet access has helped users to become less dependent on a single device or location. Apps to support user’s favorite activities are still not universally available across device types and operating systems, and this continues to reduce the ease with which users can move between the mix of devices they have access to. As app developers continue to design multi-platform apps that truly span device types and environments, this will help users expand their collection of actively used devices. We expect users to continue to use various and multiple devices, and increase their ease at switching between them. The world ahead looks good for jugglers. The analysis in this TUPdate is based on results drawn from the most-recent wave of TUP (Technology User Profile), the 2018 edition which is TUP’s 36th continuous wave. This survey-based study details the use of technology products by a carefully-selected and weighted set of respondents drawn to represent online adults. This specific wave spanned the US, UK, Germany, India, and China. From the installed base we focused in on online adults and how they use a Smartphone, PC, or Tablet through a broad collection of activities. Through analysis of these results we identified which type of devices they used primarily for these activities. Current TUP subscribers may request the supporting TUP information used for this analysis or for even deeper analysis. For more information about MetaFacts and subscribing to TUP, please contact MetaFacts.